Ozhotels provides business and leisure travellers with a directory of independently owned and non-related hotels and serviced apartments providing accommodation in the Melbourne CBD. Oz hotels allows you to deal directly with the hotels and apartments in the Melbourne city centre, hence giving you the best possible rates for this Melbourne CBD accommodation. Book your accommodation online directly with the hotels in the Melbourne city centre and receive discount rates for longer stays !!! 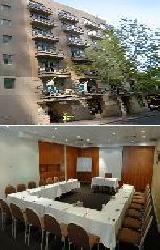 The Melbourne CBD is a great accommodation location because everything is within easy reach. Melbourne city is beautifully laid out in a central grid pattern which makes getting around either on foot or one of the many city train easy and hassle free. The city centre obviously comprises the vast majority of corporate business offices, but it also now includes a huge selection of retail shopping in the Bourke Street Mall, Melbourne Central and Collins Place shopping centres. 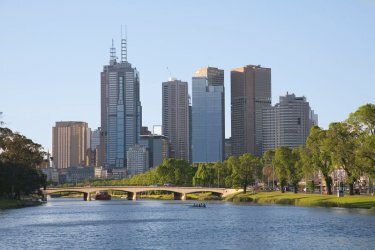 The Melbourne CBD is surrounded by many lovely parklands including the Royal Botanic Gardens, Treasury and Flagstaff Gardens. There is also Parliament House on the east edge of the CBD, Federation Square & Flinders Street Station on the southern edge of the CBD and Queen Victoria Market on the northern edge of the city. There is lots to see and do around the Melbourne CBD and there is no better way to see it than on the Free City Circle Tourist Tram. This tram operates every 12 minutes between 10am and 9pm from Thursday to Saturday and between 10am and 6pm from Sunday to Wednesday. It travels along Latrobe Street in the North, Spring Street on the East, Flinders Street in the South and along the Docklands waterfront on the West. 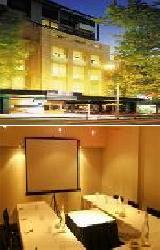 Ibis Styles Melbourne The Victoria Hotel is a historic landmark hotel in the heart of the city centre. It provides budget Melbourne CBD accommodation with easy access to the major tourist attractions, shopping, restaurants, theatres and sporting venues of Melbourne. This Melbourne CBD accommodation combines the grandeur of the late 1800s with contemporary comfort and convenience, which makes it the ideal choice for both leisure and business guests. 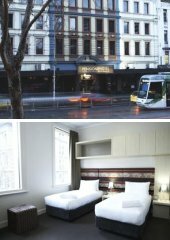 Situated right next to the Melbourne Town Hall the Victoria Hotel is also within walking distance to the Princess Theatre, Bourke Street Shopping Mall, National Gallery, Arts Centre and Federation Square. The nearby public transport also gets you to the MCG, Botanical Gardens & other Melbourne attractions with ease. The All Seasons Victoria Hotel offers a range of Melbourne CBD accommodation options which are all fully air conditioned and feature wireless internet access, daily housekeeping and use of the property's indoor heated swimming pool, spa, sauna, gym, Alice's Restaurant, Vic's bar and well equipped business centre. 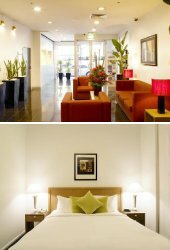 The Victoria Hotel provides exceptional value for money accommodation in the Melbourne CBD that won't break the budget. 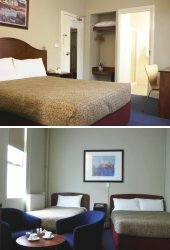 The Kingsgate Hotel is reknown for it's excellent budget hotel accommodation in the heart of the Melbourne CBD. With a range of standard and economy hotel rooms this Melbourne CBD accommodation not only has a very convenient location and but also a friendly and comfortable atmosphere. Backpackers, business and leisure travellers on a tight budget will appreciate the central location on King Street which places all Melbourne CBD attractions with easy reach including the Telstra Dome, Crown Casino, Melbourne Exhibition Centre and Queen Victoria Market. The Pegasus Apartment Hotel has a wide variety of studio & 2 bedroom hotel suites and serviced apartments available that are very well suited to the business traveller, couples, families, friends and groups. 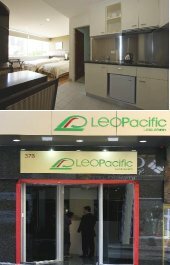 The Pegasus Apartment Hotel is perfectly postioned in the heart of the Melbourne CBD and is close to Etihad stadium, Southern Cross station, China Town, the Greek quarter, the Melbourne Museum, Crown Casino, Southbank, the Docklands, China town and the Bourke Street shopping mall. As one of Melbourne's newest accommodation options the Pegasus Apartment Hotel allows guests to truly enjoy all that the city has to offer. 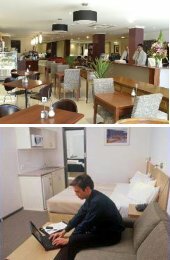 The Pegasus Apartment Hotel in the Melbourne CBD has a number of guests facilities and services including direct internet access, lift, 24 hour reception, baby cots available and daily housekeeping, as wellas a bar, cafe and restaurant due to open soon. 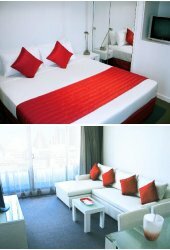 BreakFree on Collins offers quality serviced apartment accommodation in the heart of the Melbourne city centre. Located on Collins Street in the middle of the Melbourne CBD, BreakFree on Collins has a selection of studio, one and two bedroom apartments all of which have state-of-the-art finishes including marble and granite benches, parquetry floors, broadband internet access, separate lounge room and a quiet bedroom. 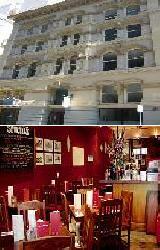 For great value Melbourne CBD accommodation in a wonderful location stay at the BreakFree on Collins Apartments. The Crossley Hotel & Apartments, Melbourne offer quality boutique accommodation at affordable rates in the heart of the Melbourne CBD. If provides both corporate business and leisure travellers with the choice of afforable hotels rooms as well as 1 & 2 bedroom self contained serviced apartments. The Crossley Hotel in the Melbourne CBD is located within easy walking distance to the famous Her Majesty's Theatre, Princess Theatre & Regent Theatre, the famous Bourke Street mall, major department stores, exclusive boutiques, acclaimed restaurants, iconic cafes and wine bars. The Crossley Hotel & Apartments, Melbourne offers a range of guest facilities and services to suit all types of travellers who are staying in the Melbourne CBD for either a short or long term stay. The Quest on Bourke Serviced Apartments is centrallylocated in the heart of the Melbourne CBD and provides both corporate business guests and holiday travellers with boutique one and two bedroom fully self contained apartments. The Quest on Bourke is surrounded by world class restaurants and theatres, as well as being within easy walking distance to great city shopping, public transport and many of Melbourne's major tourist attractions. The Quest Apartments on Bourke is a real alternative to traditional Melbourne CBD hotel accommodation, with spacious apartments that have been beautifully appointed and featuring high ceilings, air conditioning, heating, fully equipped kitchen, separate living room Foxtel cable TV, in house movies, DVD player, wireless internet, private laundry and bathroom with spa bath. This Melbourne CBD accommodation also offers a range of facilities including fully equipped gymnasium, 24 hour front desk, daily housekeeping, restaurant chargeback, tour desk, lift and security. The City Edge on Elizabeth Apartments is a brand new fully self contained apartment accommodation that features great value discount rates for both short and long term stays in Melbourne. 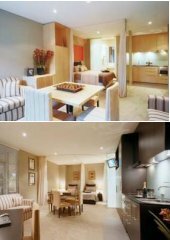 Offering studios, 1 and 2 bedroom apartments the City Edge on Elizabeth Apartments is furnished to suit both business executives and holidat travellers. Located in the heart of the city centre close to Queen Victoria Market, Melbourne Central, public transport, restaurants, shops, universities and theatres this Melbourne CBD accommodation provides apartment living without the price tag of an expensive city hotel. All of these Melbourne CBD apartments feature a fully equipped kitchen, ensuite bathroom, private laundry facilities, air-conditioning, wireless internet access and LCD TVs. 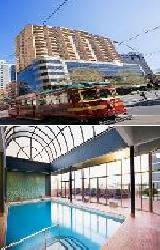 Mantra on Russell is a deluxe apartment hotel in the heart of the cosmopolitan Melbourne CBD. The Mantra on Russell Apartments gives you the best of both worlds with the comforts of your own spacious apartment and the complete facilities of a luxury hotel, which makes it the ideal accommodation choice for business and leisure travellers. The Mantra on Russell is close to everything that the city has to offer, as well as having a numerous guests facilities and services including lounge bar, business centre, conference centre, direct internet access, disabled facilities, faxing facilities, gym, lift, restaurant, room service, sauna, spa, indoor pool, 24 hour reception and daily housekeeping. The Mantra on Russell Apartment Hotel caters for corporate business travellers and offers guests a stylish haven located in Melbourne's bustling inner city. 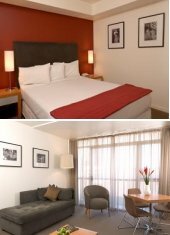 The Citadines Melbourne on Bourke is situated in the heart of the Melbourne CBD close to Parliament House, Princess Theatre, Eureka Tower, Federation Square and all of the major business and financial offices of the city. Offering stylish, modern studio, 1 & 2 bedroom self contained serviced apartments the Citadines Melbourne is the ideal accommodation base for both business and leisure guests. If you love shopping then the nearby retail therapy in Bourke Street Mall, Melbourne Central and QV shopping precincts are a must. 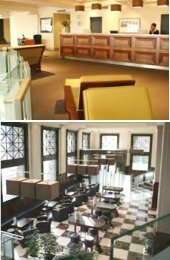 Alteratively there is also a cosmopolitan range of restaurants and cafes right at the doorstep of the Citadines Melbourne on Bourke. Guests can experience the magic of the MCG, Rod Laver Arena and Vodafone Arena with the best live sporting action such as the Australian Football League (AFL), cricket, tennis, as well as world-class concerts. When you stay at the Citadines Melbourne on Bourke Apartments you will have the privacy of your own self contained apartment while enjoying the convenience and facilities of a luxury inner city hotel, including indoor heated swimming pool, sauna, steam room, sundeck and well equipped fitness centre. 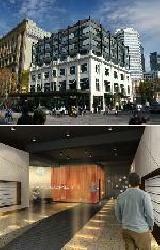 The Mantra 100 Exhibition Apartments is located near the "Paris End" of Melbourne's famous Collins Street. Guests will really enjoy the spacious and modern Melbourne CBD accommodation provided by the Mantra 100 Exhibition Apartments. Business travellers will be close to Spring Street & parliament and leisure guests will be close to Melbourne's famous theatres and East Melbourne's medical precinct. The self contained one and two bedroom apartments at this Melbourne CBD accommodation have very affordable rates with discounts available for longer stays. 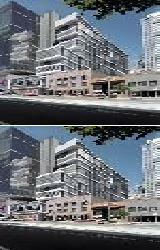 Quest on William offers luxury 1, 2 and 3 bedroom apartments located in the heart of the Melbourne CBD on William Street. The Quest on William is ideally positioned within easy walking distance to all the Melbourne CBD has to offer. The Melbourne city's business precincts, shopping districts, theaters and sporting and tourist venues are all on its doorstep. 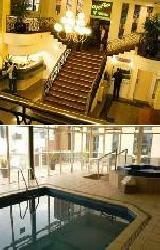 The Quest on William provides all types of travellers with discount accommodation in the Melbourne CBD. It also features a wide range of modern amenities and services such as direct internet access, faxing facilities, guest laundry, lift, secretarial services, tour desk, baby cots available and daily housekeeping. 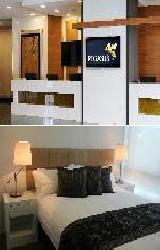 Further services include internet kiosk in the hotel lobby and photocopying services. Quest on William offers quality apartment accommodation with the convenience and service of a hotel in a fantastic Melbourne CBD location to suit the discerning corporate and leisure traveller alike. Located on Swanston Walk in the centre of the Melbourne CBD the Econo Lodge City Square provides travellers with budget hotel & apartment accommodation that is perfect for leisure guests and business corporate travellers alike. The Econo Lodge City Square Hotel & Apartments offers clean, secure and comfortable at an affordable price surrounded by a myriad of shops, theatres, restaurants and cafes. The Econo Lodge City Square in Melbourne CBD is close to everything that the city has to offer, as well as having a numerous guests facilities and services including guest laundry and lift. Business facilities include faxing facilities and photocopying services. Its perfect Melbourne CBD location and convenient access to Melbourne city attractions is that makes the Econo Lodge City Square the accommodation choice for the budget conscious business or leisure traveller. The newly refurbished Quest on Lonsdale offers studio, 1 & 2 bedroom self contained apartments that are ideally located in the heart of the Melbourne CBD.i Ideal for business travellers or leisure guests alike, the Quest on Lonsdale Serviced Apartments is positioned between Spring and Exhibition Streets, which is the heart of the theatre and restaurant precinct. THe Quest on Lonsdale in the Melbourne CBD is close to the Bourke Street Mall, Chinatown, Victoria Markets and surrounded by government departments. It also has numerous guests facilities including business centre, conference centre, direct internet access, faxing facilities, guest laundry, lift, restaurant, secretarial services, tour desk, baby cots, babysitting service and daily housekeeping. 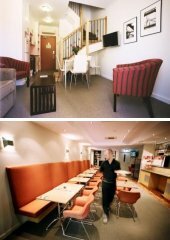 Guests staying at the Quest on Lonsdale Serviced Apartments can enjoy a leisurely stroll down one of the many quaint lane ways and discover the many delicious cafes and coffee houses of Melbourne City. Situated in the northern part of the Melbourne CBD close to the RMIT and Melbourne Universities the Milano Apartments provides the perfect apartment accommodation for both business and leisure travellers. The Milano Apartments has a variety of luxuriously appointed 1 and 2 bedroom apartments complete with everything that you would expect from a brand new 4.5 star apartment building. The Milano Apartments is within close proximity to the Queen Victoria Market, Lygon Street, Melbourne Central and St Vincent Hospital. 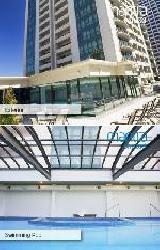 Brand new Melbourne CBD accommodation in a fantastic, central location. The Punt Hill Serviced Apartments on Flinders Lane offers a selection of studio, 1 and 2 bedroom apartments that are both spacious and extermely stylish. This Melbourne CBD accommodation is surrounded by restaurants, cafes, bars, boutiques, department stores and funky laneways which Melbourne has become famous for. Just a short walk from the Punt Hill Flinders Lane Apartments is the Bourke Street Mall, Flinders Street Train Station, Federation Square, Southbank and Crown Casino Entertainment Complex. 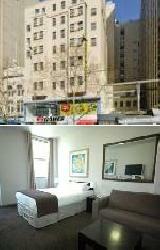 Great value apartment accommodation right in the heart of the Melbourne CBD. 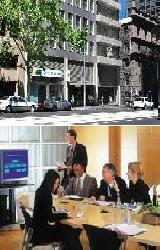 The Mantra City Central is situated right in the middle of the Melbourne CBD, right next to the Bourke Street Mall. This Melbourne CBD accommodation has a range of self contained 1 and 2 bedroom apartments which are ideal for travellers visiting Melbourne for business, sporting event, conference, shopping spree or a family holiday. 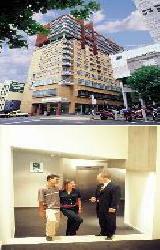 The Mantra City Central is an excellent choice for quality affordable Melbourne CBD accommodation. The Punt Hill Serviced Apartments on Little Bourke provides corporate and leisure guests with spacious, stylish apartment accommodation in the heart of the Melbourne CBD. Situated in the middle of Chinatown this Melbourne CBD accommodation is within easy walking distance to all of the city's attractions including the Old Melbourne Gaol, State Library, Treasury Gardens, Captain Cook's Cottage, Melbourne Central and Queens Victoria Market. The Punt Hill Little Bourke Apartments are also close to many of Melbourne's theatres including Her Majesty's Theatre, the Comedy Theatre and the Princess Theatre. The Plum Apartments on Collins offers contemporary self catering studio apartments, 1 bedroom apartments and 2 bedroom apartments in a fantastic central location in the heart of the Melbourne CBD. This self contained Melbourne CBD accommodation has easy access to public transport, Crown Casino, Southbank, Queen Victoria Market and Telstra Dome. This makes the Plum Apartments on Collins Street the ideal apartment accommodation for a weekend break in Melbourne or for the business executive requiring an extended stay in the Melbourne CBD. If you are looking for luxury 1, 2 or 3 bedroom apartments at the 'Paris End' of the Melbourne CBD then look no further than the Punt Hill Manhattan Apartments. This warehouse-style Melbourne CBD accommodation in ideally positioned close to the Victorian Parliament, Treasury Gardens, Federation Square and the free city circle tram. This wonderful city location make the Punt Hill Manhattan Apartments a great accommodation base from which to visit all of the Melbourne CBD attractions. Stay at the Flagstaff City Inn and enjoy the comfortable and convenient hotel accommodation that is only minutes from the centre of the Melbourne CBD. With a range of discount hotel rooms and a location close to Telstra Dome, Docklands, Crown Casino, Southgate, Queen Victoria Market and the Spencer Street bus & train terminal this Melbourne CBD accommodation has something for everyone. Guests staying at the Flagstaff City Hotel can even jump on the free Melbourne City Circle Tram, enjoy one of the many fine dining restaurants or relax in the nearby Flagstaff Gardens. 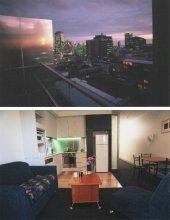 The Habitat Apartments provides self contained 1 bedroom serviced apartments that are centrally located in the heart of the Melbourne CBD. It is a great alternative to hotel accommodation because these modern serviced apartments offer more space than a hotel but still have hotel style facilities. Located on Elizabeth Street in the heart of the Melbourne CBD, the Habitat Apartments are a short walk to all Melbourne city business district, dining, shopping, transport options and tourist attractions. It also features a wide range of modern amenities such as direct internet access, guest laundry, gym & fitness equipment, lift, sauna, bbq, indoor pool, airport shuttle, security, baby cots and babysitting service. Stay in the heart of the Melbourne CBD in a self contained apartment for the same price as a hotel room at the Habitat Melbourne CBD Accommodation. 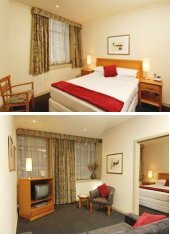 The Pensione Boutique Hotel Melbourne is conveniently located in the heart of the Melbourne CBD and offers discount hotel accommodation for coproate and leisure guests who are travelling on a budget. This Melbourne CBD hotel has been modelled on the grandeur of the original European pensione hotels and seemlessly combines historic building features with modern design and facilities. This unique Melbourne CBD accommodation has been specifically designed to cater to the discerning budget conscious traveller and offers a warm and inviting atmosphere. Offering spectacular views of the beautiful Carlton Gardens or city skyline, Mantra on the Park offers more space and facilities than the traditional hotel room. The Mantra on the Park offers luxury serviced 1 and 2 bedroom self contained apartments which are an ideal base for your next Melbourne getaway or business trip. Mantra on the Park is located in the heart of the Melbourne CBD, minutes from Melbourne's cosmopolitan city scene, famous shopping precincts, theatres, restaurants, cafes, Royal Exhibition Building, Museum of Victoria, China Town, Old Melbourne Gaol and Lygon Street restaurants. The Mantra on the Park Apartments also offers all the facilities and services normally associated with a quality hotel including 24 hour reception, porter service, restaurants, indoor heated pool, sauna, tour desk, concierge, room service, laundry service, in room massage and daily housekeeping. The central location, combined with premier guest services and facilities will make your stay at Mantra on the ParkApartments Accommodation the ideal choice for stylish Melbourne leisure and corporate accomodation. 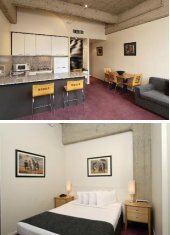 The 140 Little Collins Apartment Hotel offers modern 1, 2 & 3 bedroom self contained serviced apartments and loft accommodation, conveniently located in the heart of the Melbourne CBD. The 140 Little Collins Apartment Hotel is a friendly hideaway in the heart of the city within easy walking distance to the Melbourne icons incuding the MCG, Rod Laver Arena, Federation Square, Southbank and Bourke Street Mall. This fantastic location, with access to all Melbourne has to offer, is ideal for both the business and leisure traveller. Most apartments feature striking views of the city and all are complete with air conditioning and heating, a fully equipped kitchen and full laundry facilities. All apartments have been recently refurbished to the highest standards. The small but friendly team offers exceptional service, who will gladly arrange airport transfers, tours, flowers, chocolates and anything else you may wish for. Come and experience true hospitality at 140 Little Collins Apartment Hotel. 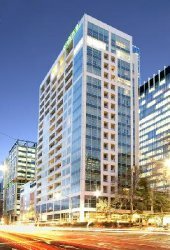 The Adara Apartments provides luxury studio, 1 and 2 bedroom apartments located at the Paris End of Collins Street in the heart of ther Melbourne CBD. Located in the heart of the Melbourne City business and entertainment district, Adara Apartments offers stylish boutique 'home away from home' accommodation. Also being opposite the magnificent Regent Theatre, next to the Athenaeum Theatre and only a short walk to the colourful and vibrant Southbank, The Arts Centre and scores of al fresco cafes, restaurants, bars, markets and food halls the Adara Apartments the perfect place to stay in the city. Also some of Melbourne's most well known venues including the Melbourne Cricket Ground (MCG), Ethiad Dome, Rod Laver Arena (Tennis Centre), HISENSE Arena, Federation Square, Bourke St Mall, Botanic Gardens and Yarra Park are just minutes away. This Melbourne CBD apartments accommodation is the ideal choice for the corporate traveller and those wanting an inner city holiday or weekend away. The apartments are fully self contained and furnished with the latest modern furniture and bedding. The Adara Apartments offers a large range of facilities and services including an onsite complimentary gym, complimentary guest laundry, restaurant chargeback, baby sitting booking service, tour desk, airport shuttle and weekly housekeeping. The Discovery Melbourne Hostel Backpackers is a truly fun place to stay in the city and features a wide range of hostel & budget hotel accommodation centrally located in the heart of the Melbourne CBD. The property is located close to cafe filled laneways, cool bars, markets and spacious parks. The Discovery Melbourne Hostel Backpackers is the perfect hostel in the city of Melbourne and has numerous guests facilities and services including lounge bar, conference facilities, faxing facilities, guest laundry, lift, restaurant, tour desk, bbq faiclities, massage room, landscaped garden, airport shuttle, security access, 24 hour reception, daily housekeeping, non smoking property, luggage storage, photocopying services and facilities for disabled guests. The Discovery Melbourne Backpacker Hostel also has lots of entertainment and tours to keep guests happy including city walking tours, markets and beach tours, free wine & cheese night, games nights, beer olympics and beanbag cinema. Situated in the heart of the Melbourne CBD, Quest Fairfax House Apartments accommodation offers easy access to the commercial hub of Melbourne and only a short stroll away is the shopping precinct at Bourke Street Mall. The Quest Fairfax House provides boutique apartment accommodation in the heart of the Melbourne CBD with a range of studio, one, two and three bedroom apartments, all with a spaciousness not available in a city hotel. The Quest Fairfax House is ideal for corporate and leisure travellers, offering boutique style apartments accommodation, all fully furnished, self-contained and non smoking. Quest Fairfax House is in easy walking distance to the shopping & business precincts and a short tram ride to all of Melbourne's most popular attractions including the Melbourne Aquarium, Crown Entertainment Complex, Federation Square, Queen Victoria Markets, and the Melbourne Exhibition and Convention Centre. Facilites and services include breakfast packs, pantry shopping service, baby sitting service, tour desk, lift, complimentary newspapers, safe deposit box at the front desk, valet dry cleaning, 24-hr security, secretarial services, fax and copying services. The Oaks on Market provides individuals, couples and families with excellent apartment accommodation in the heart of the Melbourne CBD. Located on Market Street in the city this 4.5 star luxury Melbourne CBD accommodation is just a short walk to Crown Casino, Southgate, Telstra Dome, Melbourne Aquarium, Southern Cross Station and the Bourke Street Mall. 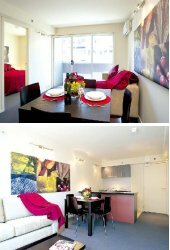 At the Oaks on Market Apartments guest can choose from a range of affordable studio apartments, stylish one bedroom apartments and spacious two bedroom serviced apartments. This self contained apartment accommodation is ideal for business and leisure tourists visiting Melbourne with discounts for longer stays. The Oaks On Collins Apartments is conveniently located in the heart of the Melbourne CBD, directly opposite the Rialto Towers and only a short walk from the Melbourne Aqaurium, Crown Casino, Telstra Dome, Melbourne Exhibition Centre, Federation Square, Bourke Street shopping mall and the Southbank restaurant precinct. This Melbourne CBD accommodation provides luxuriously appointed studio apartment suites and studio executive apartments which have been specifically designed to ensure that your stay in Melbourne is both memorable and relaxing. Situated in the heart of the Melbourne city centre The Quest Gordon Place offers spacious Melbourne CBD accommodation in studio apartments and spacious 1 & 2 bedroom apartments. The Quest Gordon Place is set in a delightful historic building with contemporay, stylish decor and excellent hotel facilities. With easy access to all of the business and leisure activities of Melbourne the Quest Gordon Place provides the ideal Melbourne city accommodation for the corporate or leisure traveller. located close by to the Quest Gordon Place is the Victorian Parliament, Chinatown, cafes, shops, restaurants and theatres. Nomads Melbourne offers the best budget accommodation in Melbourne with cheap backpackers beds and value for money hotel style private rooms. 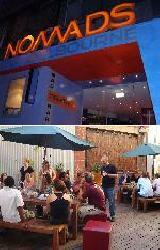 Nomads Melbourne Backpackers Hostel sets a new standard for hostel, backpacking and budget accommodation. Nomads Melbourne Backpackers Hostel accommodation is Melbourne's first purpose built flashpackers, offering travellers a unique backpacking experience, redefining backpacker hostel accommodation. The Nomads Melbourne in Melbourne CBD is close to everything that the city has to offer, as well as having a numerous guests facilities and services including lounge bar, direct internet access, faxing facilities, free car parking, guest laundry, lift, tour desk, bbq, security, 24 hour reception and daily housekeeping. With comfortable leather lounges, video juke box, fox sport showing premier league football, pool table, wireless internet and rear sun deck there is always good times to be had at the Nomads Melbourne Backpacker Hostel. Located in the heart of the Melbourne CBD on Little Bourke Street and just a hop, step and a jump to the Bourke Street Mall the City Garden Hotel is a charming 6 storey heritage building which has been extensively renovated and converted to a quality boutique hotel. This budget Melbourne CBD accommodation comprising of a range of discount hotel rooms, studio apartments and family sized two bedroom apartments. Within close proximity of the hotel is Hardware Lane where there is a strand of street side boutique restaurants offer an array of exciting cuisines. 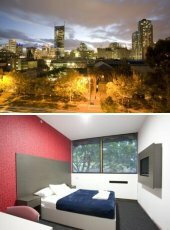 The City Garden Melbourne CBD Hotel is also just a short stroll to bustling Chinatown precinct with it's many shops and wide variety of delicious cuisine. 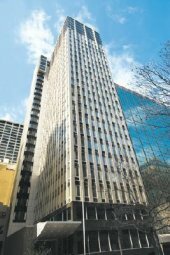 The Quality Hotel Batman's Hill on Collins provides travellers to the Melbourne city centre with luxury hotel and apartment accommodation right in the Melbourne CBD. The Batmans Hill is situated directly opposite the newly refurbished Southern Cross Station, interstate & airport bus service and the direct factory outlet shopping centre. Also within close proximity of this Melbourne CBD accommodation is the Crown Casino Entertainment Complex, Melbourne Aquarium, Southgate, Melbourne Exhibition & Convention Centre, Docklands Precinct and the Telstra Dome Stadium. 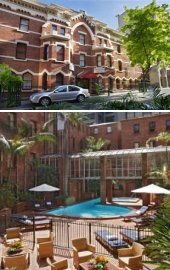 This Melbourne CBD apartment hotel is perfect for the most discerning of business executives or holiday travellers. The Oaks on Lonsdale Melbourne CBD Apartments is the ideal accommodation base for both business and leisure travellers to the city. The Oaks on Lonsdale is conveniently located near Parliament House, the Government Precinct, Melbourne's Theatre District, the MCG, St Vincent's Hospital and Rod Laver Tennis Arena. All of these luxury Melbourne CBD apartments are brand new and have been stylishly furnished to ensure that your next stay in Melbourne feels like you haven't left home. 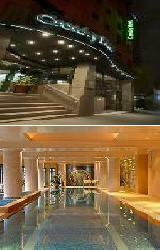 Luxury 4.5 star Melbourne CBD accommodation at discount prices. 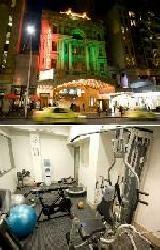 If you are after cheap Melbourne CBD accommodation in a central location then stay at Space Hotel (formerly Victoria Hall). Space Hotel is a modern budget Melbourne CBD accommodation hostel which is located close to the Melbourne Central shopping centre, Queen Victoria Market, Lygon Street restaurants, RMIT & Melbourne Universities and St Vincent's Hospital. This Melbourne CBD hostel has been specifically designed to offer you a choice of spacious twin, queen and dorm rooms all with shared bathroom facilities. 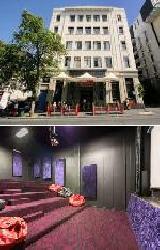 The Alto Apartment Hotel is located on Bourke Street in central Melbourne. This Melbourne CBD accommodation is ideal for both the business and leisure travellers who want that little special something when staying in the city. Guests can choose from a range of stylish and contemporary accommodation including executive hotel rooms, studio apartments, 1, 2 and 3 bedroom apartments. Within walking distance to many of Melbourne city's attractions including Telstra Dome, Crown Casino, Melbourne Exhibition and Convention Centre and the Docklands precinct the Alto Apartment Hotel is a city accommodation that you will want to come back to again and again. 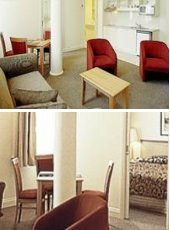 The Clarion Suites Gateway offers luxurious Melbourne CBD accommodation in a wonderful, central location. 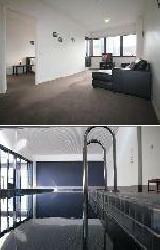 These stylishly appointed Melbourne city apartments provide excellent accommodation at very affordable, discount rates. The Clarion Suites Gateway is ideally positioned only a few minutes walk from the Telstra Stadium, Crown Casino entertainment complex, Federation Square and the many restaurants and shops in Melbourne's famous Southbank district. 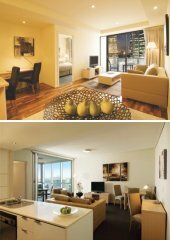 For luxury Melbourne city accommodation overlooking the lovely Yarra River stay at the Clarion Suites Gateway Apartments.